Benefits of optimizing warehouse & inventory operations have a direct and positive impact on profit. Labor costs, space cost, obsolescence cost and cost of urgent purchases are some of the costs associated with un-optimized inventory processes. The most painful of the cost is of not having a critical component when required. It has the possibility of stopping many important operations. In Asset-intensive industries like Ports & Terminals, EPCI (Engineering, Procurement, Construction, and Installation) and Power, components are specialized, high-value and have long replenishment time. In today’s competitive environment, there is zero tolerance to inaccuracy and there is huge pressure on reducing costs. Thankfully technology like mobility, RFID’s and Bar-coding are enabling this goal. IFS is more than ready for it with its Warehousing Data Collection (WADACO) functionality. IFS WADACO uses mobility and bar-coding technology to automate every step in inventory management. This includes tasks like Purchase Order Receipts, inventory issue, movement, cycle counting etc. It also includes Bar-code Label Printing using handheld printers. An application like IFS SCAN IT under WADACO, also support Near Field Communication (NFC) tags. It also enables a simple mobile camera to act like a bar-code reader. 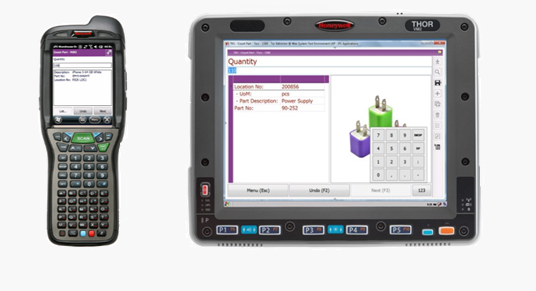 IFS WADACO supports a wide variety of handheld terminals including normal mobiles, rugged devices or vehicle mounted devices. It supports Android and Windows platforms. Mobility enables real-time and accurate inventory details. This enables right decision making optimized inventory level, saving stock-outs and avoids obsolete inventory. Also automation results in employee efficiency. Envecon has the expertise and proven track record of saving working capital, stock-out costs and improving employee efficiency using IFS WADACO. IFS WADACO enables automation, accuracy and employee efficiency. It is quick to implement. It saves costs and has a high ROI (Return on Investment).